Curious You: On Your Way! is a perfect sendoff for children of all ages entering a new phase of their lives. Follow along with George in classic scenes from many of his original books as he provides words of congratulations and encouragement to anyone who has accomplished much but still has many things to see, to do, and to dream! The ideal gift book for a graduation, a promotion, or any occasion, Curious You: On Your Way! helps to celebrate all of the milestones of our lives. This inspirational story reminds readers young and old who are moving up or moving on that they have a special someone cheering for them as far as their curiosity can take them! Nieces and nephews will appreciate this inspiring book about their favorite monkey. 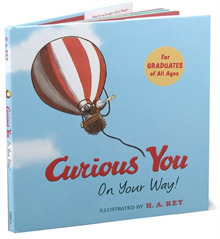 A compilation of scenes from the original Curious George books accompanied by words of encouragement make this an endearingly nostalgic gift for graduates from kindergarten through college.